In 1964 Hungary had developed and put in to production the D-442 FUG Scout Car. Behind the Iron Curtain, the West would rely on intelligence gathered on the various National Military Parades in WARSAW Pact countries to identify vehicles and when almost identical vehicles to the FUG were seen on parades over the late 60’s, the West called these vehicles FUG-66 & FUG-70 thinking they too were Scout Cars like the original FUG. However they were mistaken. What they had identified were actually early prototypes of a new vehicle based on the original FUG, designated the D-944.00 PSzH, aka PSzH-IV. 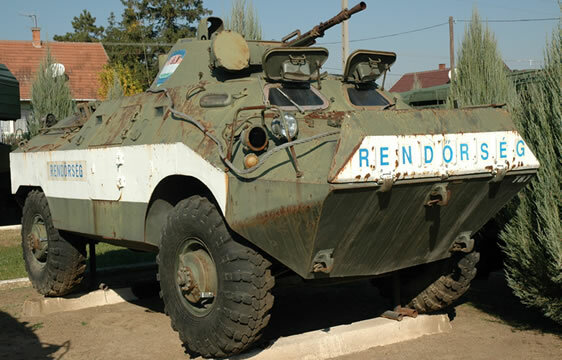 The PSzH stood for “Páncélos Szálltó Harcjármü” which roughly translated in to English is “armoured personnel carrier”. 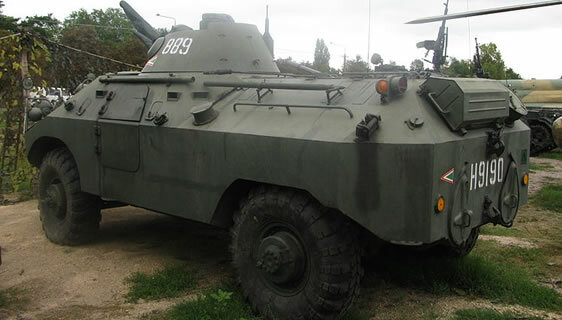 Production of this new vehicle ran from 1970 to 1979 for both the Hungarian Army and the export market. The PSzH-IV was a 4×4 wheeled APC. It had a crew of three and could carry 6 troops. The driver and vehicle commander sat up front, behind them was the fighting compartment where the turret (mounted with a 14.5mm Heavy Machine Gun and 7.62mm Coaxial MG, manned by the third crewman) and 6 troops were located. Behind this was the engine compartment. The troops could disembark via two part doors in the sides of the vehicle. The crews had additional roof hatches. The Welded steel construction gave protection from small arms fire and artillery splint shells. The crew also have armoured shutters they could lower to cover their windows relying on vision blocks. The vehicle had NBC protection and was able to lay smoke screens using its smoke grenade launchers. Unlike the FUG, the PSzH-IV did not have the x4 small retractable wheels to increase off-road mobility. It was fitted with x2 rear water-jets to propel it in the water. It used a 100hp Csepel D.414.44 diesel engine giving a top-road speed of 80km/h.